Since the kids are into everything related to zombies this year, we thought it would be fun to make a few spooky candy apples. 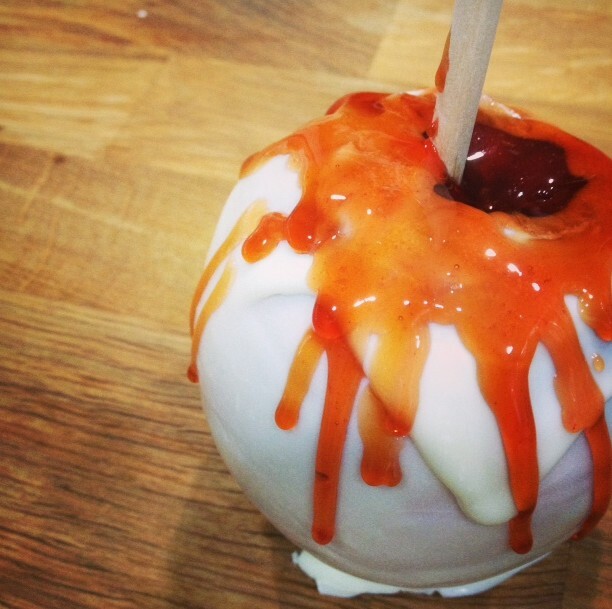 The great thing about candy apples is you can dip them in anything you like: melted chocolate, candy syrup, marshmallow fluff perhaps even adding a little flavoured liqueur for a more adult version. Anything! You can also coat them with your favourite toppings: colourful sprinkles, nuts, crushed candy bar. Be creative and try different combinations or stick to the classic red candy apple. We stopped by Wagner Orchards and Estate Winery to pick up a few apples. There are still apples on the tree so if you haven’t had a chance to head out this year, hurry! This originally started as a simple white chocolate candy apple that we were going to dip in crushed peanuts or drizzle with dark chocolate, but after dripping red candy syrup over them (it was actually more like me being a clutz and dumping syrup all over the apples and kitchen counter…on a side note a half white chocolate and half red candy apple looks pretty cool too…trying to get hard candy off kitchen surfaces..not so cool), we ended up with this version. Wash apples under cold water and dry them with a dish towel. If you’re apples have a wax coating try boiling 6 cups of water and with 1 tablespoon white vinegar. Quickly dip the apples in the boiling water for 5 seconds and then thoroughly dry them. This will help the candy to stick. Insert skewers into each apple about two-thirds of the way through to ensure that the apple doesn’t slip off. Line a cookie sheet with wax paper. You may be wondering why we used lemon juice in the recipe instead of the traditional ingredient of corn syrup. Well, if you can’t tell there’s already enough sugar in the recipe. In order to avoid adding more, we substituted the highly processed corn syrup with lemon juice. There should be no flavour difference and the lemon juice helps protect your sugar syrup. If you want to limit the amount of refined sugar or eliminate it all together, try using natural or raw sugars instead. Melt the chocolate in a double boiler. I simply fill a pot with a cup of water and set a stainless steel bowl on top. Add the chocolate into the bowl and put the heat on low. Stir the chocolate until it becomes smooth. Tilt the pot sideways so the chocolate pools to one side. Dip the apple into the chocolate to coat it. Then place it on the cookie sheet and allow the chocolate to cool and harden. In a small pot combine 1 ½ cups sugar with up to 1/3 cup of water. Just enough to moisten the sugar. Add in the lemon juice. Mix ingredients. Add 1 teaspoon of red food coloring. Place pot on the stove and bring to a boil. Using a candy thermometer to monitor the temperature, cook until the sugar solution measures 300 to 310 degrees F.
Turn off the stove and remove the pot from the heat when the syrup reaches 310 degrees F. Be very careful as the syrup is extremely hot. Using a pastry brush drizzle the hard candy over the chocolate covered apple letting it drip down the sides. Leave the apples on the cookie sheet to cool.